It’s coming up to that season once again. The time when it feels like everyone you’ve ever known has decided to get hitched just to remind you how truly alone you are. And although a winter wedding is an easy event to dress for, once the sun comes out and invitations start flying through your letter box, it’s a completely different story. During the winter there really are only two options a guy has to choose from: a tuxedo or a dark neutral suit. That’s all there is to it. I tend to go with navy during the day and grey during the evening, with a tuxedo if the dress code dictates. As long as the suit is made from high quality medium-weight wool and you keep the details simple and classic, you can’t go wrong. However, what makes dressing for a wedding during the winter months so easy is the exact same reason dressing for one in the summer is so hard: trying not to upstage the groom. Because as much as you want to make sure your suit says “meet me at the bar”, rather than the office, you don’t want it to say “look at me, not the guy at the altar”. Or even worse, “look at me, not the woman at the altar”. Trust me when I say that last one will always get you in trouble. Let’s face it, as soon as the ceremony is over it’s time to get on it. And as someone who is truly committed to cutting a rug at any wedding he attends, believe me when I say that wearing something seasonal is a must. Stick to linens, cotton or tropical wools to avoid being the sweatiest guy at the reception. This is summer wedding 101. Pick up a khaki suit in a cotton/linen blend, keep it slim in the cut and finish with neutral pieces like a white dress shirt and a monochrome tie – you can’t fail. Plaids aren’t just for winter. 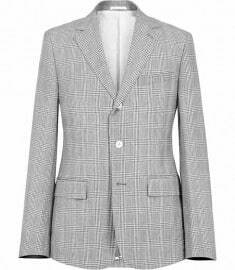 A suit in a subtle grey check is the perfect accompaniment when going stag or with a plus one. The other great thing about any suit with a check or stripe is that you can pick out a subtle colour within the pattern using your shirt or accessories. For example, I’ve got a tobacco brown plaid suit with green in the checks that I love pairing an olive knit tie. For me, not only are these the shoe style of the summer, but they add a point of interest to any look. White buck skin (or suede) shoes work so well because they are the very definition of neutral – they will go with anything. Sure, they’re bound to get a little bit roughed up during the evening reception, but they only end up looking better for it, if you ask me. The easiest way to sharpen up your summer wedding style without freaking out the bride or groom is to venture away from the usual white or blue dress shirt. Whether you opt for a tuxedo or a suit, pairing it with a pink, lavender, grey or khaki dress shirt can be a great way of adding a pop of colour without going over the top. This summer is all about pastel colours anyway, so why not introduce them? Again, this is a nice and subtle way of upping your style points at any event this summer. By opting for ties and pocket squares in interesting colours, patterns and textures you will breathe new life into even the stuffiest of nine-to-five suits. Great for those who haven’t got the funds for a whole new outfit. Gingham checks in monochromes, colourful polka dot or anything made from chambray are ideal for creating that ‘twist on a classic’. Just remember to keep everything else simple and refined to show that you understand the dress code but still want to have a bit of fun. So there you have it, a few basic guidelines that I tend to follow when I’m putting together my outfit for a summer wedding. The key is to be mindful of the bride and groom – it’s their day after all – and, as tempting as it may be, showing them up is not the best of wedding gifts. Just get them some plates instead; they’ll appreciate it a lot more. As always, I want to hear what you have to say, so leave a comment below. What do you tend to wear to a wedding, be it summer or winter? Are you as considerate to the groom? Any cautionary tales that you can share? Let us know. Next week’s article will be about what it’s like from the other side of the fence – how to dress if it’s your own wedding.